A massive winter storm that walloped southern Ontario this week moved through Quebec and the Maritimes Wednesday, closing schools, restricting travel and shuttering many businesses and offices for the day. 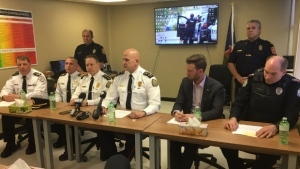 Few areas were spared as activities across much of eastern Canada were disrupted, from the Dennis Oland murder trial to outdoor events at Quebec City's famous winter carnival. "It's been a long day," said Troy Arsenault, who fought a losing battle as he cleared snow from the steps in front of Fredericton's Beaverbrook Art Gallery Wednesday. "It's our third time here .... The wind keeps blowing the snow right back to where we've cleared it." Arsenault said the drifting and rapid accumulation made it one of the worst storms of the winter. Jill Maepea, a meteorologist with Environment Canada, said much of New Brunswick could expect close to 35 centimetres of snow from the storm by Wednesday night, with more on the way. "Another band of weather is expected to add a few more centimetres Wednesday night in New Brunswick," she said. 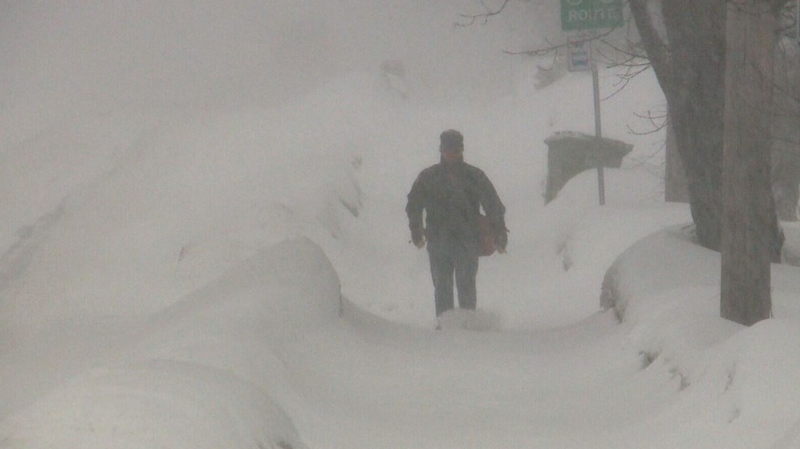 All of New Brunswick and P.E.I., and much of Nova Scotia and southern Quebec were under similar winter storm warnings. 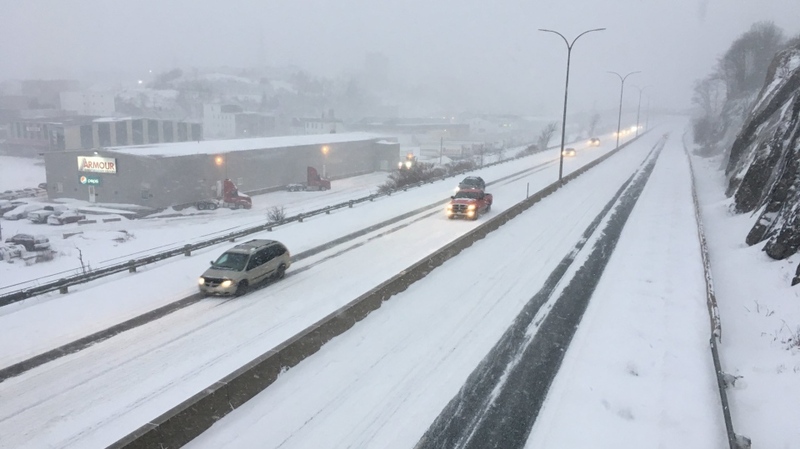 Areas of western Nova Scotia also received heavy snow Wednesday morning, but weather in much of the province had changed over to freezing rain or rain by midday. Environment Canada said winds could also gust to 80 kilometres an hour and combine with freezing rain to make travel treacherous. The courts in Saint John opened as scheduled Wednesday morning, but closed at noon due to the blizzard, adjourning Oland's re-trial in his father's murder for the day. A "no travel advisory" for New Brunswick highways was issued Wednesday. Al Giberson, general manager of MRDC -- the company responsible for the stretch of Trans-Canada Highway between Fredericton and Moncton -- said snow was accumulating as fast as four to five centimetres an hour. "The real challenge though is the heavy snowfall, and the wind that has come with it, has made visibility very poor. Driving conditions are very treacherous," Giberson said. In Quebec City, the weather was bad enough that even the famed winter carnival was forced to close its outdoor activity sites Wednesday. 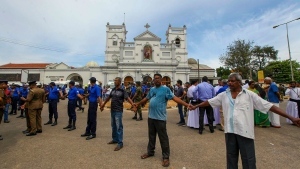 Organizers said the temporary closure was necessary to ensure the "safety of everyone." Between 20 and 40 centimetres of snow were expected to fall in Quebec depending on the region, with strong winds reducing visibility on some roads to almost zero. Several highways were closed Wednesday morning, including Highway 20 in both directions between Levis and Montmagny. Most of the province's schools were closed, with more than 50 of 72 school boards declaring a snow day. All Montreal universities were also closed, as were Universite Laval in Quebec City, Universite du Quebec a Trois-Rivieres and Universite du Quebec en Outaouais. Meanwhile at the other end of the country, Environment Canada lifted snowfall warnings for British Columbia's south coast, but conditions were still treacherous in some areas and frigid temperatures persisted in parts of the province. Snow continued to fall over parts of southern Vancouver Island and the Fraser Valley, prompting some school closures as well as the suspension of all BC Transit service between Abbotsford and Hope. On Vancouver Island and the Sunshine Coast, residents were digging out after about 60 centimetres fell in some areas, while arctic winds kept wind chill values close to -20 in the Sea-to-Sky region. The weather office says another system is bearing down on the south coast of British Columbia and could dump more snow on higher elevations by Thursday night. A pedestrian braves a winter storm in Fredericton on Feb. 13, 2019. Blowing snow reduced visibility along Highway #1 through Southern New Brunswick during a winter storm on Feb. 13, 2019.